Francisco Baez' work was "sterling" this night in August 1990, The Eugene Register-Guard wrote. Baez went five innings, giving up just two hits and one unearned run. He also got a no-decision, according to The Register-Guard. Wins were hard to come by for Baez in 1990. Between short-season Eugene and single-A Appleton, Baez got just one, to 10 losses. Baez was in his second season as a pro that year. He went on to play in two more. He never made AA. 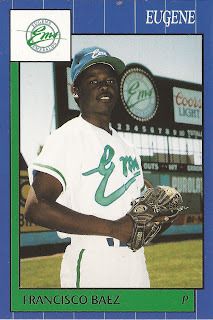 Baez' career began in 1989, after signing with the Royals as an undrafted free agent out of his native Dominican Republic. Baez started with the Royals in the rookie Gulf Coast League. He went 4-4, with a 2.67 ERA in 18 outings, eight starts. He moved to single-A Appleton for 1990, but started just 1-7, with a 5.44 ERA in 10 starts. He then moved to short-season Eugene. There, he went 0-3, with a 3.40 ERA. In a late-June outing for Eugene, Baez went three innings, giving up six runs, three of those earned. He then lost some time mid-season, after injuring his right hand. Baez returned to Appleton for 1991, coming back as a reliever. In 44 games there, he had a 3.31 ERA. He also picked up five wins. It was Appleton again for 1992. In 38 outings, his ERA came in at 2.90. He made high-A Wilmington in 1993. In 28 relief outings that year, he had a 5.05 ERA. It was his final year as a pro.